This is where Chaucer's Canterbury Tales story begins. Description: �In Southwerk at the Tabard as I lay; Redy to wenden on my pilgrymage,� Geoffrey Chaucer, Canterbury Tales. England's greatest medieval poet, Geoffrey Chaucer, was born around 1342, the son of a wealthy London vintner, and he died in 1400. Despite travelling widely and leaving a number of notable works, Chaucer is best remembered for one journey and one incomplete 17,000-line masterpiece. 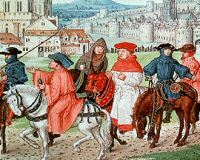 The Canterbury Tales follows a band of unforgettably rumbustious pilgrims on their way from Southwark to St Thomas a Becket's shrine in Canterbury. The trip, which gave him the material for the Canterbury Tales, began on this spot in April 1386 at the Tabard Inn. The stable yard is now called Talbot Yard. In the book, after supper, the jolly host of the Tabard, Harry Bailly, declares that not this year has he seen such a mixed bunch under his roof. He rides out with the pilgrims the next day, and proposes that, in order to help pass the journey, each of them should tell two tales on the road to Canterbury, and two on the way back to Southwark. The pilgrims agree that the one who tells the best tale will be treated to a supper by the others, when they return to the Tabard in Southwark. (It�s a brilliant ploy to bring the customers back.) The full tales were never completed though. So just 24 of a possible 120 are in the book � and the incomplete book ends before they even get to Canterbury! 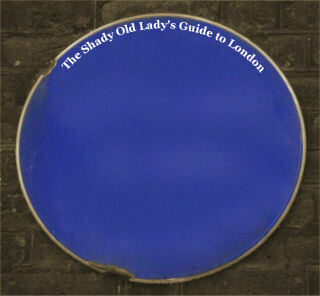 The location of the Inn is now within the Copyprints Centre, and a plaque adorns the wall. Talbot Yard still exists.